Competitive wages, low energy prices and cheap production cost as a result, rated Bangladesh the top investment destination for Japanese companies last year, according to a recent survey. 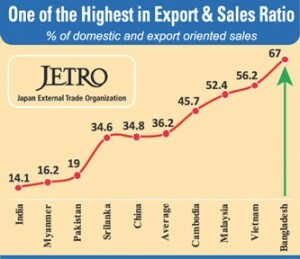 The Japan External Trade Organisation (JETRO) conducted the survey on more than 20 countries in Asia and Oceania, which found Bangladesh as the most lucrative investment destination both in manufacturing and non-manufacturing sectors, for the second consecutive year. The wages in Bangladesh are one fourth of China and half of India, the survey added. Low energy prices and foreign investment friendly business environment add additional values to the sourcing, production and manufacturing in Bangladesh. The JETRO survey on the ‘Conditions of Japanese Companies in Asia and Oceania’ said the country can be an attractive destination for Japanese investment as production cost in Bangladesh compared to Japan is less than half. It is 82 per cent in China, 73 per cent in Vietnam and 80 per cent in India, the survey added. Though the survey rated Bangladesh high for business confidence with highest 63.3 points, operating profit of some Japanese companies remains a concern, according to the survey. Business confidence of the Japanese companies is expected to improve in 2016. According to the JETRO survey, 44.8% of companies expect operating profits to increase, while those predicting a downturn decreased from the outlook for 2015, down to 13.3%. Among the reasons for improvement, “sales increase in local markets” ranked first. In emerging countries such as Bangladesh, Cambodia and India, the diffusion index (DI) – the proportion of businesses reporting increased operating profits minus those reporting decreased operating profits compared to the previous year – exceeded 60 points, representing a significant improvement of business confidence. The annual survey of the JETRO conducted during October and November 2015 interviewed Chief Executive Officers of over 9,590 companies ranking Bangladesh at the 5th place from the top as 67.4 per cent of Japanese companies opted for future expansion in the country. The survey showed high growth potentials, reduction of cost, review of production and distribution network and easy to secure labour as reasons for their expansion. Some 230 Japanese companies have invested in the country mostly in export processing zones involving US $ 250 million, according to the JETRO. The CEOs of Japanese companies found volatile management problems related to quality of employees, competitors, little scope of local procurement and quality control as some of the challenges they faced. Over 57 per cent CEOs think that the quality of employees are not up to the mark while half of them want to concentrate more on quality control. Some 56.3 per cent focused on complicated customs clearance in Bangladesh. But 70.6 per cent consider local procurement as the biggest challenge for expansion in Bangladesh. 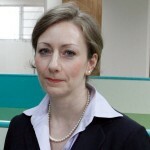 The survey showed that companies in Bangladesh have to procure materials from China followed by Japan indicating poor development of support and backward linkage industries as well as connectivity with South East Asian countries, particularly by sea. Competitiveness Adviser and former Wall-Street professional Mr. Kauser Bhuiyan explains this market situation as opportunities for other Japanese companies. For example, to fill the gap creating support and backward linkage supply chain to the EUR 25 billion textiles and apparel industry of Bangladesh, as Mr. Bhuiyan stressed. Currently, almost all such supplies are coming from China, India, Pakistan, Turkey, Korea, Italy and Germany whereby Japanese companies play marginal role until now. He thinks Japanese companies can tap into the large pool of demand in the yarn, fabrics, dye, chemical, enzyme, machinery, spare parts, energy and resource efficient technologies and process know-how on one hand and human resource development on the other. Optimisation of rate of return on investment or healthy profitability of a business is all about right allocation of resources and competitiveness in the market, which many Japanese companies are yet to learn and accept in the ever changing global competition environment. They should increasingly focus on finding the right balance between quality and costs of a product than just making the best products in the world; and last but not least profitably sell those to the global market competing with other players in the market place, Mr. Bhuiyan adds. Along the same line, JETRO recommended creation of congenial business environment to help reduce cost of Japanese companies doing business cutting down operational costs.